Her white and red Chanel necklace. I grew up with those pearls around her neck. And her diamond ring. During the war my grandfather, running away from the Germans to hide in the mountains of Grenoble, afraid a building he owned would be seized, exchanged it for a diamond ring. Not a good deal. My grandmother did not talk to him for a year. 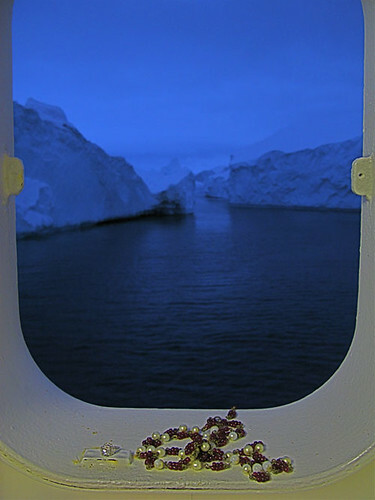 So I waited to reach the most northern place of this trip, where I could go ashore with my mother. Laurie, my roomate on the boat, suggested that, if the weather did not allow us to do so, I still could flush the ring down the toilet. Actually, it is a thought my mother would have loved. During a few minutes I imagine her laughing to tears to this idea. But the weather was good. 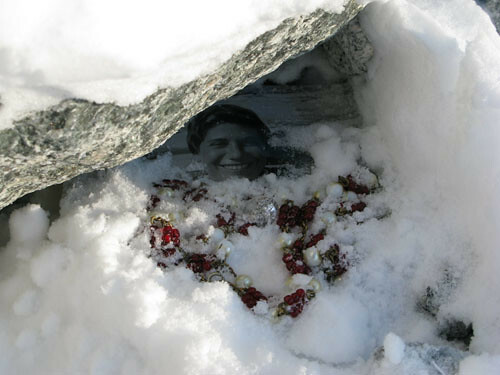 I buried the portrait, the necklace, the diamond. Cried a little. Took a photo. Martha sang a verse of Marylin Monroe – my mother’s other passion along with the North Pole – diamonds are a girl’s best friend. Now, my mother has gone to the North Pole. 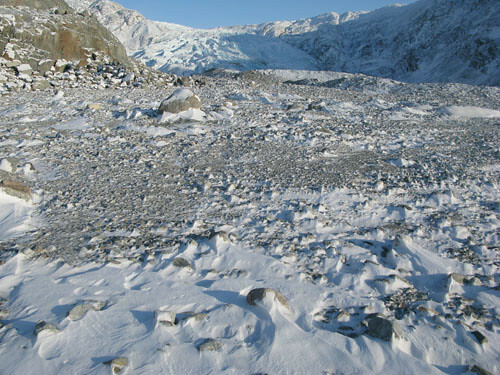 I wonder if her glacier will advance or retreat, if the climate changes will carry her to the sea to be taken north by the West Greenland current, or retreat up the valley towards the ice cap, or if she will stay on the beach as a marker in time where the glacier was in the holocene period. And maybe in thousands of years, specialists in glaciology will find her ring and discuss endlessly this flash of diamond in Inuit culture. Or if a treasure hunter or beachcomber will discover it and exchange it for a house in the mountains of Grenoble. this follows all your work, remembrance, sadness, loss, interest in women, family – sweetness too. Well done again Sophie. I am speechless. The beauty of this is indescribable. i may be kind of incompetent when it comes to finding homepages, yours is hidden. anyway. I´ve been trying to reach you because im very intressed in your work with elder and youth in stockholm. Im trying to make a reasearch at konstfack stockholm about charing visual worlds. Anyway. Why dont you send me an email and tell me about your project? im interested in your experience of “the making of knowledge” that the participants made. by the way, i spent a few weeks between illulisat and kangeslussuaq this summer. it was wonderful, especially diskobay. Bonjour! My name is Kiff and I am a student at Brighton and I have chosen to study your work as I saw it for the first time in Paris a few years ago and I was so inspired by it that I had to see more! I have read all your books and also some written by other people about you but to get an email from my hero would just be a dream. I understand you are very busy but if you have any time at all for your number one fan it would be more than much appreciated! !